Having your children have a say in what they eat allows them to feel responsible and gives them a great sense of encouragement. Talk to your children about healthy options so that they know how to make the right choices when putting an input about what goes into their lunch. Find a spot in your kitchen and make it the lunch packing station and get lunch prepared with your children the night before. Creating a theme for your children’s food or using cookie cutters to make shapes of of breads, cheese, deli meat and even special cutters to add designs into your children’s fruits. Kids love snacks, and they supply your children with energy throughout the day, so make them nutritional. Packaged snacks don’t usually have the proper nutrients and can sometimes be packed with sugar. 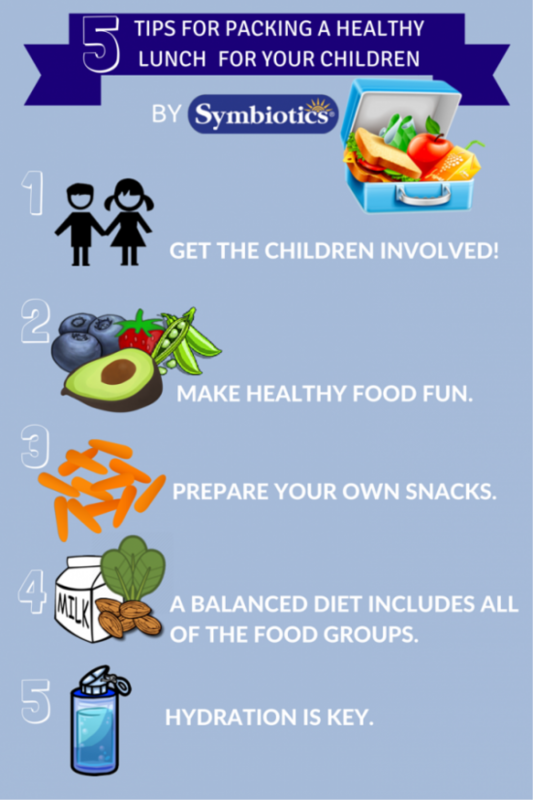 Taking control in the kitchen the night before with your children can help make nutritious snacks fun. Make sure to incorporate all food groups: fruits, vegetables, lean protein, low-fat dairy and whole grains. Encouraging hydration with your children is important. Water provides all the means for energy and school-aged children should drink between 6-8 cups of water a day. Allow your children to choose their favorite water bottle, this may make them more inclined to drink from it. If water is too boring for your children, add frozen fruit to boost its flavor and keep it chilled.